Members of the Maine Mayhem give the camera attitude. From left: Ariane Bowie, Jaimee Gammon, Wendy Newton, Elizabeth Sullivan, Alicia Jeffords, Theresa Hendrix, Kristianna Springer, Haylee Graves, Jessikah Lopez and Sam Sargent. 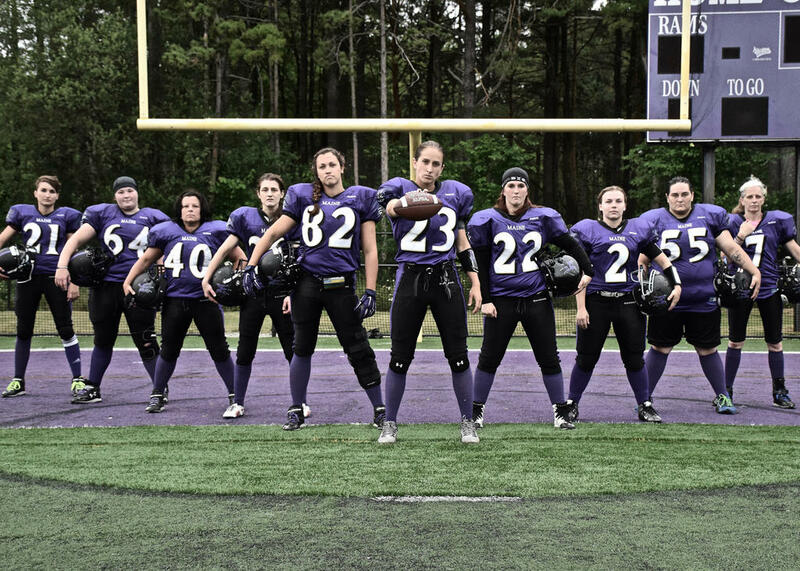 The Maine Mayhem semi-pro women’s football squad out of Gorham is wrapping up its inaugural season in style: Having gone 4-4 this spring, the Mayhem earned the opportunity to visit Charlotte, N.C. from July 21–23 to participate in Championship Weekend. Affiliate teams aren’t able to win as spot in the World Championship, also slated to take place that weekend in N.C. As such, the Mayhem’s particular honor is a matchup in the League’s “Affiliate Bowl,” which kicks off at 10 a.m. on Friday the 22nd. Their opposition in that bout will be the Knoxville Lightning. Jeffords (for the sixth time) and several of her teammates have also been selected to take part in Saturday the 23rd’s All-Star game. Jeffords and Paula Beaulieu earned First-Team All-Star honors for their play this season, and Theresa Hendrix, Frankie Curtis and Jessikah Lopez all won Second-Team laurels. The Mayhem rose from the ashes of the Maine Rebels, sold off and shipped to New Hampshire last year. 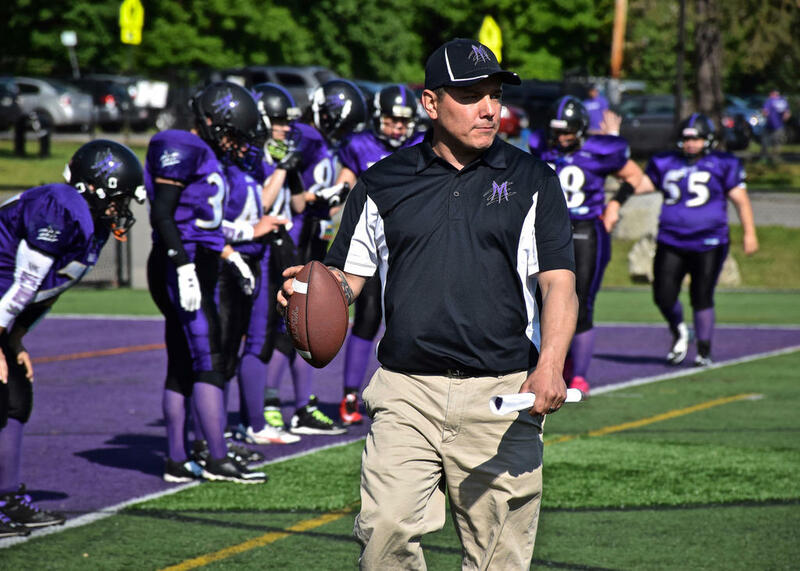 Jeffords herself was instrumental in ensuring that women’s football in Maine survived the Rebels’ demise, and is the Mayhem’s President. Jeffords’s fellow members of the Mayhem Board of Directors are Vice-Presidents Rohner and Frankie Curtis, also a player; Treasurer Kate Archambault, a retired player; and Secretary Paula Beaulieu, another player. 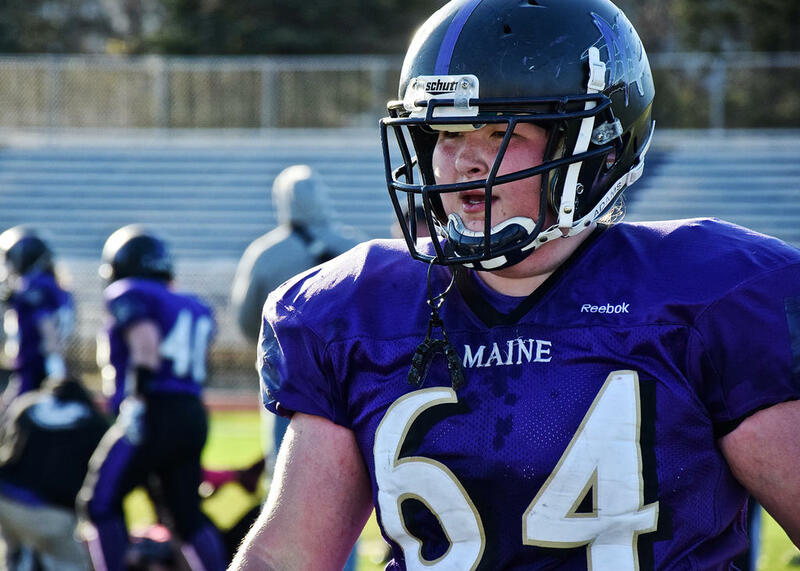 And then, of course, there are the players, who hail from across southern and central Maine and even Massachusetts, and whose passion for the game is apparent. The Mayhem won their first game of the season 24-6 on the road at the New York Knockout. They then dropped a bout, 52-0 to the towering Montreal Blitz. They took their next two, 32-6 and 40-0 against the Connecticut Hawks and the Knockout, respectively. After losing a second big one to the Blitz, they also fell – but very narrowly, 2-0 – to the New England Nightmare. Their last two games were another loss to the Nightmare, 8-14, and another win over the Knockout, 28-0. “We have talent, heart, strong bonds and passion,” Gammon said when asked about the difference between this season and previous seasons. Both Hendrix and Gammon say that being part of the Mayhem family has changed their lives for the better. 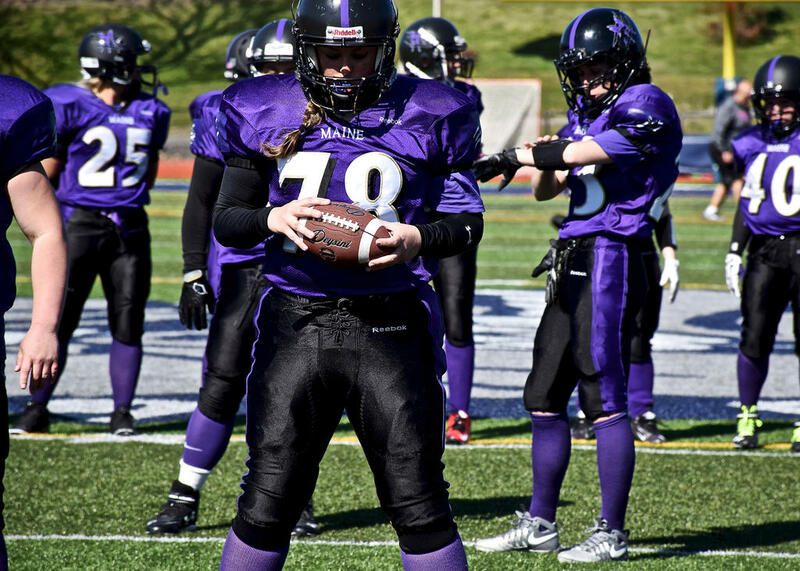 “Football has helped me take my aggression out on the field,” said Gammon. “Before, I was a pretty shy person, but now I’m not as scared and nervous of things. “Being part of a group of ladies who love the sport, the competitiveness, the teamwork, the athleticism and have the same goals has been amazing,” said Hendrix. 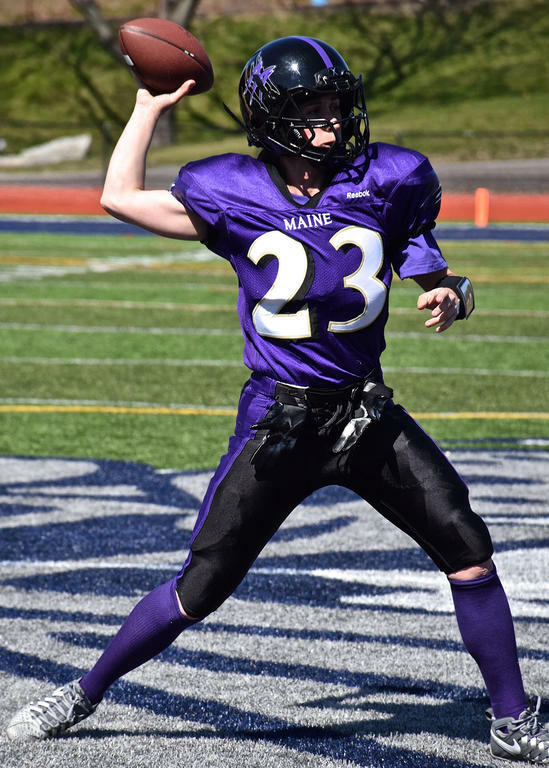 The Mayhem are online at www.mainemayhemfootball.com and www.facebook.com/mayhemfootball2016. Mayhem head coach and vice president Jeremiah Rohner walks the sidelines. Jaimmee Gammon, a 2015 graduate of Bonny Eagle, is just wrapping up her first season with the Mayhem. The Mayhem’s Jennifer Meyers gets in the zone, prior to the action. Scarborough’s Theresa Hendrix unwinds into a throw in Maine Mayhem action earlier this season.